Following the winding up of Swansea Cork Ferries, John Hosford and Adrian Brentnall set up a website, â€œBring Back The Swansea Cork Ferry in April 2008, to high-light the loss of the service. In May, it was announced that the ship a number of groups had there eye on, the Christian IV was sold to Russian interests for â‚¬13m, who renamed her the Julia. However, the campagin continued throughout the first half of 2008, with widespread media coverage, and worldwide online publicity. When Noel Harrington was elected County Mayor of Cork – he pledged his support for the campaign, and set up a co-ordinated programme between Cork and Kerry councils and their counterparts in Wales aimed at financing the new ferry service. By August, the campaign was being mentioned on nation radio, and by December, four possible ships, and the Port of Cork had consultants draw up a business plan, with a bank agreeing to fund 60% of the start-up costs. In Febuary 2009, the campaign began raising funds to help purchase the Julia, after Stella Lines went into liquidation. The group set up a co-op to raise â‚¬3 million, and in the space of the first week fundraising raised â‚¬2 million. A public auction to sell the Julia was held on 26 February 2009, but no bids were made. In a second auction held on 12 March 2009 the Irish consortium made the highest bid of â‚¬6 million, but confusion surrounded the initial undertaking of â‚¬1.5 million to secure the ship and she remained unsold. No further auction was held, instead the bankrupt’s estate negotiated directly with potential buyers. In addition to the Irish consortium, Greek Halkidon Shipping Corporation and two unnamed Finnish companies were reported to have shown interest in the ship. The West Cork Tourism Co-operative announced on 2 April 2009 that they were close to agreeing on a deal to buy the Julia. On the 7 April 2009 the West Cork Tourism co-operative shareholders, meeting in Skibbereen gave their unanimous support to the deal and elected a Board of Directors with the power to conclude the deal with the Finnish liquidator. The co-operative is setting up the new ferry company to run the service, which will be called Fastnet Line after the Fastnet Rock lighthouse off the West Cork coast. The West Cork Tourism Co-operative announced on 5 May 2009 that they will launch the new ferry service on 1 March 2010 and they are going ahead with the purchase of the Julia. Following a funding agreement with an unnamed Finnish bank, a preliminary sale agreement was signed between Fastnet Line and Julia’s owners on 15 July 2009 for an undisclosed price. 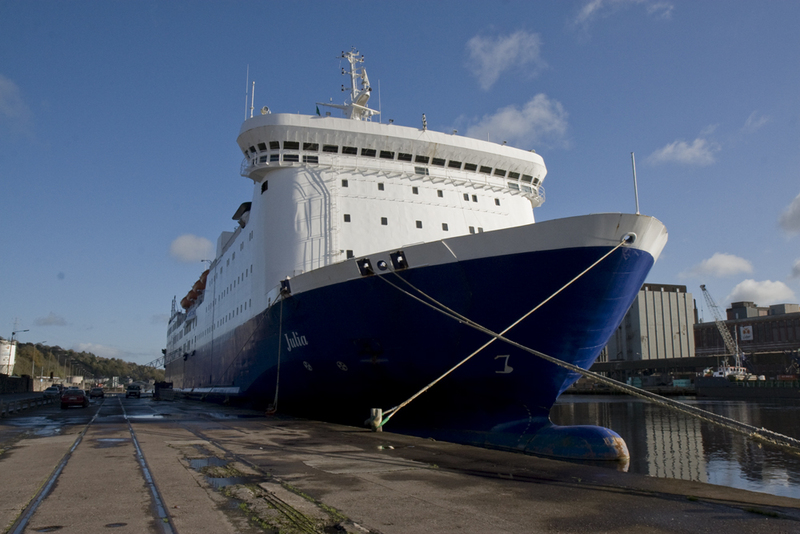 The Finnish courts decided to sell the Julia and this was announced on 15 September 2009 following discussions with the creditors of Stella Lines. On 1 November 2011 the company suddenly canceled sailings, and entered into examinership. As of January 2012 its business plan was for it to become a seasonal ferry service from April 2012. The company was seeking sponsorship, with the vessel to be named by the sponsor and used as a large billboard. However, on Thursday 2 February it was announced that the company would cease operations as the company failed to fund â‚¬1.6 million rescue package (blaming state aid rules) with the loss of 78 jobs, the Julia is currently laid up in Cork.